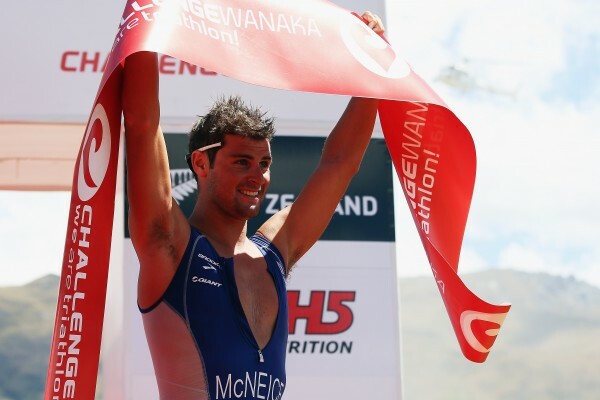 New Zealand triathletes Dylan McNeice and Gina Crawford are the 2013 Challenge Wanaka champions after setting commanding leads over the field in windy conditions. Crawford triumphed over a stomach bug suffered earlier in the week to set a new women’s course record of 9:24:31, bettering her previous record by about four minutes, while McNeice had a break through victory in his first long distance triathlon, after 10 years racing as a professional over the Olympic distance, finishing in 8:51:18. 2011 champion Jamie Whyte (NZL) (8:55:43) and Chris McCormack (AUS) (8:58:05secs) were second and third respectively, with McCormack clawing his way into contention for the podium after a windy bike ride. Candice Hammond (NZL) (9:44:22) ran down Joanna Lawn (NZL) (9:44:30) in the final 2km to finish second in the women’s race, with Lawn collapsing with exhaustion on the finish line in third. The race started in a storm and finished in brilliant sunshine for former surfer McNeice, who showed his supremacy over the men in the extremely choppy Lake Wanaka by completing the 3.8km swim first in 47:56. He beat his closest rivals Bryan Rhodes (NZL) and Whyte out of the water by several minutes and slowly extended his lead throughout the 180km cycle. Whyte got a foot in front after McNeice stopped to go to the toilet early in the 42.2km run, but McNeice quickly re-established his dominance and ran away from Whyte in the first lap of the two lap course. “I just couldn’t believe it. I was out in front the whole time and kept expecting to be caught. The only time I was caught was while I was in the toilet,’’ McNeice said afterwards. The dark horse of the men’s field admitted he had a race plan to run easy for the first 5km of the marathon and then do 5km hard and then repeat the pattern. “But I ended up running the whole thing hard. The course was awesome. There were people everywhere. I never thought I would race a long distance race. I never really wanted to and now I can see why!’’ he said. McNeice described racing four-times world title holder McCormack as “cool’’ and had expected McCormack would run him down. McCormack said the race was “absolutely spectacular’’ but he had cursed the wind and the hills many times. “What an event. I will be back for this next year. I wanted to win it but I got stung by two very big guys out there today. I won’t be making that mistake again,’’ McCormack said. Whyte was disappointed but philosophical about failing to get the measure of McNeice and he too vowed to return in 2014. “It reminds me of the race I had here in 2011, where I raced off the front all day,’’ he said. Crawford was first woman out of the water in 59:14, with a 30 second lead on her rivals and had extended this to 10 minutes on Auckland’s Joanna Lawn by the 100km mark on the 180km bike leg. “The swim was really slow. I think that was the first time I’ve done an hour in the swim. I didn’t think I had a chance of cracking the course record but then I had an amazing bike ride and held it together in the run,’’ Crawford told media after finishing her race. Crawford was uncharacteristically emotional on finishing to an enthusiastic crowd and apologised for crying. “It was great running down the finish. It meant so much. Thanks so much,’’ she said. Crawford said she had entered the race feeling uncertain about how it would go after being sick earlier in the week. She had felt weak in the latter stages of the run but had pushed through it. Winning for the fifth time was “really, really special’’, Crawford said. Race director Victoria Murray-Orr was delighted with the event, which attracted up to 1500 athletes competing in the full iron-distance race and the Lake Wanaka Half (1.9km swim, 90km swim, 21.1km run). “A course record broken, record crowds, record field, a career-changing victory for Dylan, a fifth win for Gina – and the world’s top athletes experiencing this spectacular but tough and honest course – what more can you want!” she said.